THIS CAPTIVATING CLIFFTOP RETREAT, A RELAIS & CHÂTEAUX PROPERTY, BOASTS A STUNNING VIEW OF THE ENDLESS SAPPHIRE WATERS OF THE INDIAN OCEAN. Cape Weligama lies on the island’s most southwesterly edge, just before the coast begins to curve up towards the east. Nearby, centuries-old temples and the 400-year-old Dutch colonial Galle Fort recall the region’s maritime history. 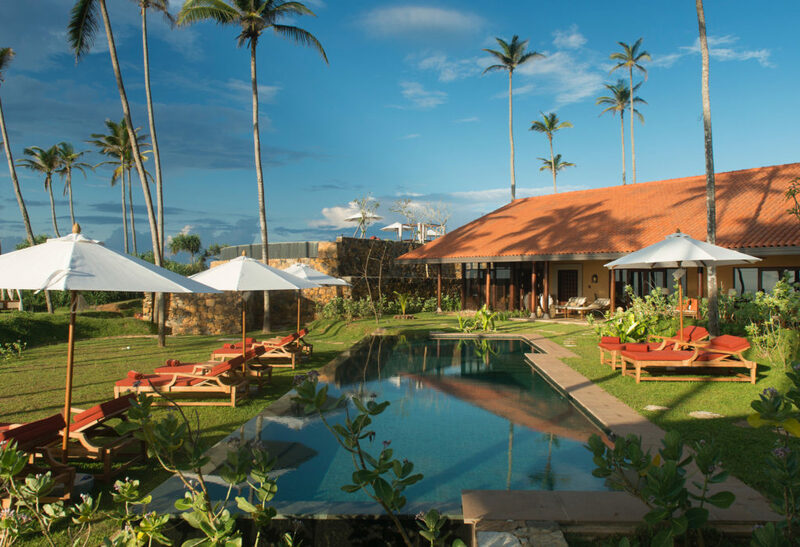 Just 39 private retreats invite total relaxation, while the resort’s myriad activities beckon by day – from dipping into the crescent-shaped infinity swimming pool to diving, kayaking and bicycling. A pampering spa brings treatments to your own suite or villa – we love the homegrown spice scrubs of clove, nutmeg, sweet orange and sandalwood. Dining is sublime, and again purely Sri Lankan, with its homage to the day’s freshest catch cooked to order, complemented by an extensive menu of hand-selected wines. Cap off the day with a traditional Ceylon high tea or linger over sunset cocktails.